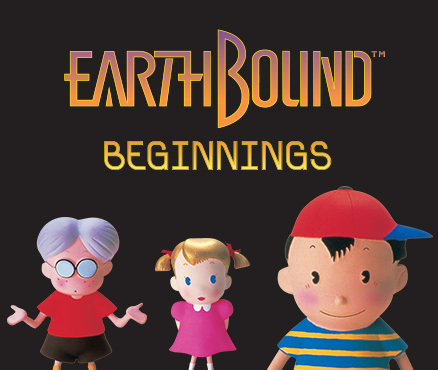 EarthBound Beginnings (a.k.a. Mother) is the first game in one of my absolute favourite video game franchises. Originally it was only released in Japan (in 1989) but then in 2015, it was released internationally, which is a very pleasant turn of events. In fact, it was my favourite piece of news from E3 2015. The Mother series has three installments and, ironically enough, this was the one which I played last. Considering that the second and third games were on the SNES and Game Boy Advance, I was a bit worried that the first game might seem less good due to the fact that it was on the technologically inferior Famicom. Thankfully, while the game does show its age in some areas, it is still very fun and evokes the same magical, sentimental and surreal feelings as the other two. Just like the later installments, it takes the JRPG formula (usually associated with fantasy settings) and applies it to 20th century America. It works really well. You play as a young boy named Ninten (who is very, very similar to the better-known Ness) who suddenly finds strange paranormal activities occurring within his home. His father then tells him that his grandfather had investigated psychic powers and Ninten sets off on an adventure to save the world from similar paranormal anomalies which are happening elsewhere. You soon find out, that to do this you must find the “eight melodies” which merge together into one long piece of magical music. Then, after that, you’re basically left to just figure out what to do by yourself. You can head out into the world and pretty much go where you please – interacting with strange, comical people in towns who will tell you things and ask you to do things for them. You’ll end up exploring cities, desserts, caves and even bizarre dreamscapes on your quest to find the eight melodies. The world isn’t as big as the world of the later games, but it’s still fun to explore and there are lots of strange and interesting things to find. You don’t have to do things in a set order either, which is nice. As you explore the world, there’ll be random encounters with various creatures, ranging from regular animals to weird and wacky aliens and robots. You then face them in a turn-based fight. The fact that the world is generally quite normal (other than the strange creatures in it) means that it can sometimes be quite creepy. There’s that feeling of 1950s America, UFOs and Roswell. One of the only problems the game has is that sometimes I think the graphics just look kind of bad. I’m pretty accepting of retro graphics, but this game sometimes feels too minimalist. I also felt that the lack of direction made the game a bit too hard at times, because I did spend quite a while just wandering around trying to figure out what to do. You also need to do quite a lot of level grinding at times – which I actually enjoy, but I know some people hate it. But, ultimately, for a game of its age, it is very, very good. I’d say that it is one of the very best NES/Famicom games. It might not be quite as good as the other two, but it’s still a great start to the series and something which I think fans of Mother/EarthBound and fans of retro games should definitely try.